Place Charles-de-Gaulle is located at the South end of the park, alongside Sherbrooke Street. Sculpture in the shape of an obelisk, consisting of seven superimposed elements. Depending on the point of view, it offers either uniform or fragmented surfaces. 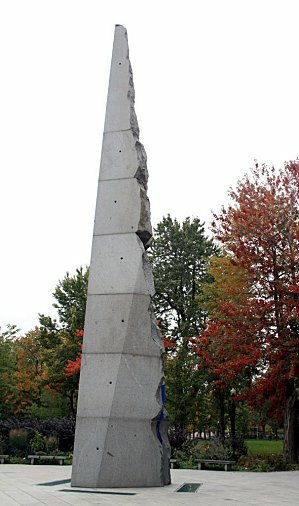 A vertical blue crack runs through the whole sculpture. Two engraved bronze plates accompany the work. The first features a quote by Général de Gaulle and the other explains the context in which this donation was made. The work was inaugurated in the presence of Mr. Jean Doré, Jacques Chirac and Xavier Deniau (deputy of the Loiret Department, in France) as well as a group of Québec nationalists. During the ceremony, Félix Leclerc's song L'Hymne au printemps was played as well as Sambre et Meuse (military air). The two bronze plates were stolen and replaced. A replica of the work was supposed to be installed in Paris, near Porte Maillot, but the project never came to fruition. De Gaulle’s message in 1944: "Vive le Canada"